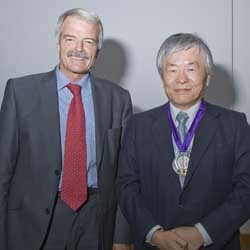 Nobel laureate Professor Susumu Tonegawa (Nobel Prize for Physiology or Medicine 1987) delivered the 2008 UCL Prize Lecture in Clinical Science on 'Molecular and Circuit Mechanisms for Hippocampal Memory' on 13 October 2008. Professor Tonegawa gained the Nobel Prize "his discovery of the genetic principle for generation of antibody diversity." Since 1997, UCL has awarded a Medal Prize to honour a series of distinguished and pre-eminent clinical scientists. The associated Lecture is now one of the highlights of the UCL academic calendar and has become a well-known fixture within the field of contemporary science. The event stimulates debate, celebrates important scientific advancements, and most importantly, does this in a context of learning which inspires the young minds of today to greater achievements. The Prize Winner receives a unique commemorative medal, crafted by Tom Lomax (UCL Slade School Lecturer), and delivers a lecture to a large audience of basic and clinical scientists, university academics, graduate students and interested friends of UCL. UCL's global focus is reflected in the choice of recipients from around the world. Professor Tonegawa was only in his 30s when he demonstrated that antibody diversity is achieved by the shuffling of genes that are used to produce specific antibodies. In the early 1990s, Tonegawa's scientific interest switched to neurobiology, when he began exploring the effects of missing or altered genes on learning and memory in mice in his laboratory at MIT. He has since pioneered a way to make the technology more specific, so that a gene can be turned off only in a highly restricted area of the brain and only in the adult animal - an achievement that has proved critical to studying learning and memory. In 1981 he was appointed Professor of Biology at MIT and a member of the Center for Cancer Research; in 1994 he founded the Center for Learning and Memory at MIT. To find out more about Professor Tonegawa, the RIKEN-MIT Neuroscience Research Centre, and UCL's own world-leading neuroscience departments, use the links at the top of this article.